Well now, ya can’t beat this deal. For the fourth year in a row, Darryl Baldwin and the staff of MoonDogs Too will host a traditional Thanksgiving dinner for $1. Baldwin and his staff have put on the spread – cooked on site and featuring local meats, produce and breads – since 2007. MoonDogs will be collecting donations for Helpline through Dec. 31. In 2009, the dinner drew 350 guests. Baldwin is expecting 450 this year. “Every year we’ve doubled,” he said. 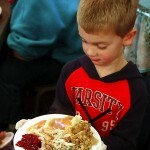 As we reported in 2009, volunteers from the community help make the buffet dinner a success. Baldwin has enough helpers for Thanksgiving, but he’s still recruiting volunteers for an encore Christmas dinner. Oh, and if you need a ride to MoonDogs, just give the restaurant a jingle before the day of the dinner, and they’re make arrangements. Thanksgiving dinner is 11 a.m. to 3:30 p.m. Nov. 25 at MoonDogs, Too, 714 Bay St., Port Orchard; (360) 895) 2300.